Asian inspired American classic. We have built on the basics to give you a new take on an old classic. Great for canapés, entrée, sides or main this is a dish for the adventurous ones. 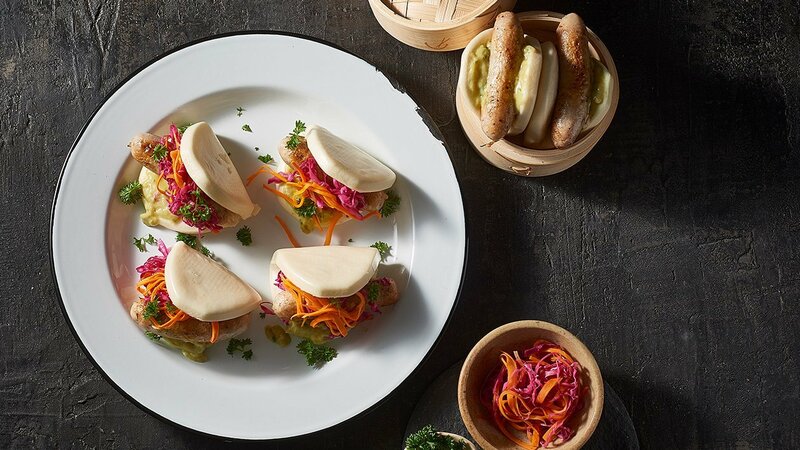 Follow directions on pack to steam bao buns (serve immediately after steaming). Using a hot pan – seal and cook chipolatas. Add KNORR Thai Green Curry Paste and cook for one minute and add KNORR Coconut Milk Powder and water and whisk until smooth. Add fish sauce, sugar and KNORR Roux and bring to the boil and simmer for one minute. Once thickened remove from heat. Bring the vinegar and sugar to a boil. Once boiled remove from heat and add in the veg. Allow to sit for minimum ten minutes to pickle before serving. Serve with more pickled veg and extra sauce for dipping.